With a stay at HOTEL FUKURACIA OSAKA-BAY in Osaka (Suminoe), you'll be within a 15-minute drive of Osaka Aquarium Kaiyukan and Legoland Discovery Center. Featured amenities include complimentary newspapers in the lobby, dry cleaning/laundry services, and luggage storage. Planning an event in Osaka? This hotel has facilities measuring 10043 square feet (933 square meters), including conference space. Free self parking is available onsite. With a stay at Ryokan Kichiman in Kochi, you'll be just steps from Ryuga Onsen and Konoka Onsen. Featured amenities include luggage storage and laundry facilities. With a stay at YADOYA UHOKU in Kyoto, you'll be within a 15-minute drive of Kyoto Imperial Palace and Nijo Castle. Located in Kyoto, Jizo House is within a 15-minute drive of Kiyomizu Temple and Sanjusangendo Temple. Featured amenities include a computer station, multilingual staff, and luggage storage. With a stay at Fuyo Bekkan in Yonago, you'll be within a 15-minute drive of Yumigahama Park and Hiyoshi Shrine. With a stay at Surfside Bed & Breakfast in Onna, you'll be a 1-minute walk from Ryukyu Islands and 10 minutes by foot from Onna Seaside Park Nabii Beach. Free self parking is available onsite. 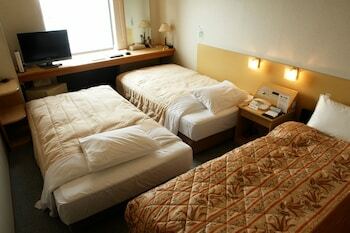 A stay at Inari Inn Gion places you in the heart of Kyoto, within a 15-minute walk of Gion Corner and Heian Shrine. Featured amenities include wired Internet access (surcharge) and luggage storage.